All you have to do is CLICK on the TITLES or the ALBUM COVERS to get your free cool stuff! The newest member to the J1 Sound Team, Phyre has put together an album based on the music from the Legend of Zelda game series. 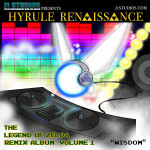 This is part one of the remix album set, with the theme being WISDOM, starring Navi. The album art was done by Melissa Barnhill. Side Note: Phyre has hosted and/or performed at every single J1 Music Fest. Melissa Barnhill is the artist/writer/creator of the J1 Studios fantasy manga, Silver. 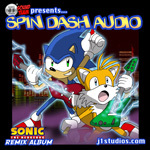 Ray Riley aka Shinigami, the head of the J1 Sound Team has put together an album based on the music from the Sonic the Hedgehog game series. The album art was done by Jason Richardson. Side Note: Notice that Sonic & Dr Eggman have headphones, and that Eggman also has turntables. Oh, his hovercraft says REMIX & SCRATCH! 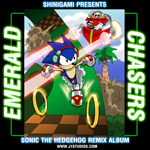 Ray Riley aka Shinigami and Forrest Shamlian (The J1 Sound Team) have put together the second Sonic the Hedgehog Remix Album! Talk about hotness for your ears! The album art was done by Jason Richardson. Side Note: The lightning from the guitar is inspired by Guitar Hero. The background is from original Sonic the Hedgehog 2 stage Chemical Plant Zone. The purple smoke was added to not just go with the rock and roll vibe, but for Chemical Plant Zone’s purple water. 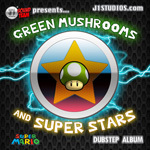 Ray Riley aka Shinigami and Forrest Shamlian aka Forrest Fire (The J1 Sound Team) have put together their first dubstep album by remixing music and sounds from various Super Mario themes. See if you can guess where they are all from! The album art was done by Jason Richardson. Side Note: The 1up Mushroom and the star in the image are the actual icon designs from the Super Mario Bros. series. The words “Dubstep Album” are put in a earthquake style font to resemble the bass rocking. 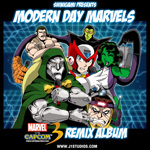 Ray Riley aka Shinigami, the head of the J1 Sound Team has put together an album based on the music from the Marvel vs Capcom 3 fighting game. The album art was done by Jason Richardson. Side Note: The team of Dr. Doom, Zero, and Super Skrull all have microphones. The “opposing” team of Mike Haggar, She Hulk, and M.O.D.O.K. all have listening devices such as headphones and a boom box! 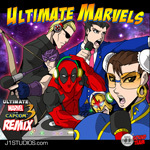 The J1 Sound Team have come together for the sequel of the Modern Day Marvel: Marvel vs Capcom 3 Remix album. The album art was done by Jason Richardson. Side Note: All the characters on the cover are the tracks that are in the album. Wesker has Umbrella Corporation headphones on. Shinigami (Ray Riley) of the J1 Sound Team has collaborated with Philadelphia producer Artistik Beatz to bring you this awesome album. 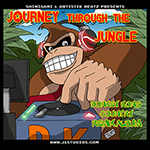 This album takes you through the world of Donkey Kong Country.The album art was done by Jason Richardson. Side Note: The player that Donkey Kong is mixing his records on is actually a Gamecube! 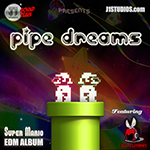 Ray Riley aka Shinigami, and Forrest Shamlian aka Forrest Fire of the J1 Sound Team have put their minds together again for a new, six-track album of Super Mario Bros EDM. Joined this time by the infamous Dj CUTMAN, the sounds you’ll hear will no doubt bring you back to your gamer glory days with a whole new flavor of modern electronic energy. Side Note: The album art was done by Melissa Barnhill (the creator of Silver).